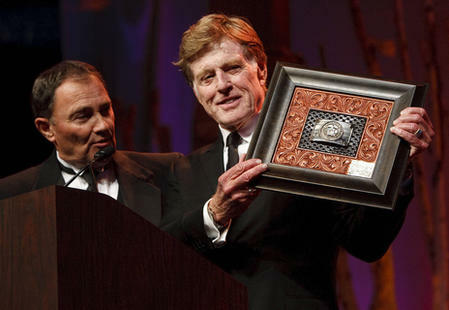 Governor Gary Herbert presenting Robert Redford with his one-of-a-kind Burns Custom Buckle–commemorating Robert Redford Day in Utah. On November 9, 2013, Burns had the great privilege of participating in “The Governor’s Salute to Robert Redford”, a gala that attracted such dignitaries as Sen. Orrin Hatch, Salt Lake City Mayor Ralph Becker, and people from Utah’s business and artistic communities. Several weeks prior to this event, the Governor’s office contacted Burns with the idea to create a one-of-a-kind buckle that captured the essence of Utah and honored Redford, a collector of intricate trophy buckles. Redford’s Sundance Film Festival and the great crowds that it draws were major factors in establishing Burns Cowboy Shop on Park City’s historic Main Street, right across the street from the Egyptian Theater. So of course, we were more than honored to join in. We passed multiple designs back and forth before choosing to use the Governor’s Seal as the centerpiece. Burns’ skilled craftsmen worked together to create the intricate sterling silver and gold buckle and our master saddle maker hand-tooled the frame for display. The back of the buckle is personalized with a special message of gratitude for Redford’s work preserving and promoting Utah on several fronts: As owner of the Sundance resort and steward of the land around it, as founder of the Sundance Institute, as head of the Sundance Film Festival that draws thousands of visitors to Utah every year, and for filming some of his best-known movies — including “Butch Cassidy and the Sundance Kid,” “Jeremiah Johnson” and “The Electric Horseman” — in Utah. Redford noted that he and some of the elected officials in the audience, many of them on the opposite end of the political spectrum from him, share common ground. “Whatever differences may exist, we can all come together and agree on one thing, and that’s our love of this state and our country and the people,” Redford said. Burns is honored to say that Robert Redford is now a part of the Burns story and that we are a part of his story.